Throughout recorded history, the role of documenting military activities has taken on many faces. Historians and journalists alike are frequently credited with cutting their teeth in austere locations, long before they land coveted positions such as evening news anchor or national correspondent (see Walter Cronkite in WWII & Vietnam). As Americans, we enjoy a protection under the First Amendment in our Bill of Rights, the "freedom of speech". Unfortunately, a very small percentage of the world's population shares this liberty, thus creating an even higher demand across the globe for somebody to tell their story. One of my additional duty assignments during this deployment has been that of "Public Affairs Officer". I have really grown quite fond of these duties, as rare as that may sound for a position in which I was voluntold. While the vast majority of news releases coming from FOB Salerno are conceived from the Brigade Public Affairs Office, a handful have come from out of the 3-19th ADT Public Affairs Office, and an even fewer amount of those were deemed newsworthy- eventually making their way to global audiences. Recently, development focused units across the Eastern portion of Afghanistan had the honor of hosting an embedded reporter, a young lady by the name of Maura O'Connor. Ms. O'Connor (as we referred to her in briefings- I've learned that the Army has to place a title on EVERYTHING) is a research fellow with the Phillips Foundation, focusing on development projects and studying the impact of foreign aid dollars on countries in conflict. After a little over a week with us here on FOB Salerno, she accompanied the Provincial Reconstruction Team out on several missions before heading up to the Paktika Province where she spent several weeks with the ADT and PRT teams in that region. 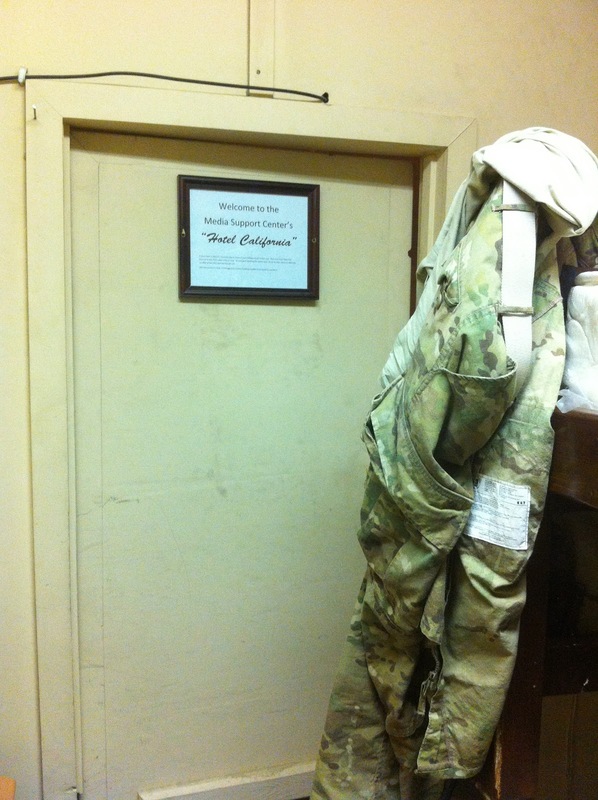 Maura learned a new term during her time around FOB Salerno- that of Hoosier Hospitality. Team members really enjoyed hearing Maura's stories from her travels, it seemed she had seen more of Afghanistan in her three weeks on ground than any of us had witnessed in nearly eight months. When we first learned that a journalist was going to be staying with the team for a few weeks, the timing could not have been worse. I'm sure the Rolling Stone jokes began to grow a bit old, but all in all I think she had a wonderful experience here with the Reapers of the 3-19th ADT. I know we're all eagerly anticipating the publication of her research; as she is closing out her Afghan travels at the end of the month, a release should be coming in the next few weeks. Once a quarter, the ISAF Public Affairs Office hosts an "Afghan Media Conference". I had the opportunity to attend my first of these conferences this past week, and have to say it was quite an enlightening experience. 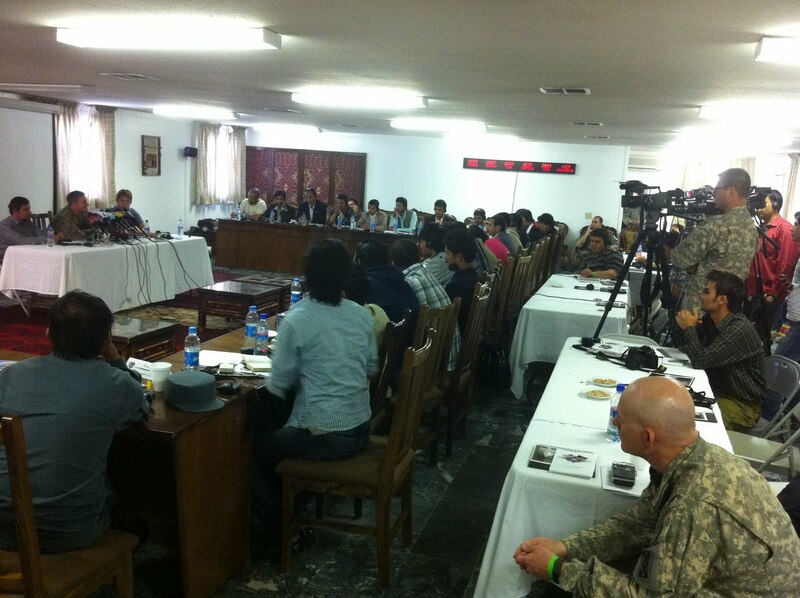 Upwards of 40 Afghan journalists filled the Jirga Center at Bagram Air Base, with the majority hailing from Kabul. During the conference, these mainly mid-to-late 20's Afghan men had the opportunity to interact with American journalists and military public affairs officials. Conor Powell, a Fox News correspondent from Kabul, shared some very blunt and practical advice to the audience- the need to dress appropriately and pack accordingly. Connor spoke of a recent mission he accompanied ISAF troops on, in which an Afghan journalist also joined- clad in a suit and dress shoes. As he was speaking, Connor stood up from behind the table he sat and gave a visual reference to all about what might be deemed practical attire while accompanying troops. His khaki/olive drab garb was loose fitting and breathable, with the ability to easily layer on more items during the evening hours as the temperature can easily fluctuate up to 30 degrees between night and day. As the emcee prepared the attendees for a breakout session, he asked that all participants first take a few minutes to go around the room and introduce themselves. As my turn approached, I worked up the fortitude to introduce myself in Pashtu, after all I'd been practicing a bit with our interpreters and had formed a solid conversational foundation back at Indiana University last summer. "Salaam Aleykum, zma num Bridman Lomont; zay de Indiana Agribusiness Development Team de Khowst Province." As I finished, I wasn't sure if I had just made up my own version of Pashglish or not, but by the applause I think the crowd got the gist of what I was trying to say. In addition to the group of Afghan reporters and American service members, several public affairs representatives from the French Army were also in attendance. France is a major ally in the coalition fight, fielding an entire Brigade sized effort known as Task Force La Fayette. 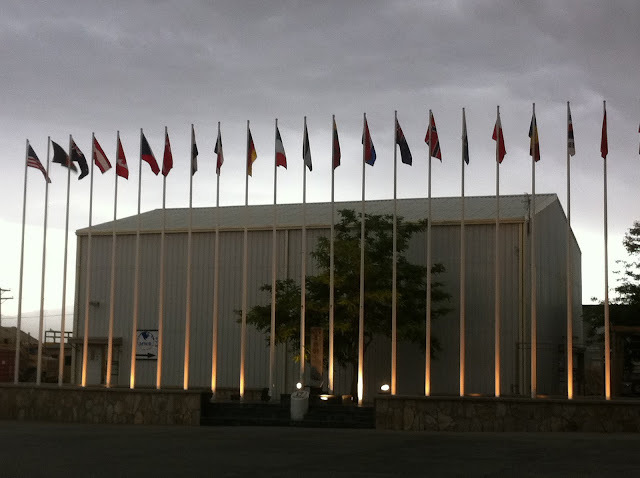 The conference came to a close around 3PM. This was designed to give those traveling back to Kabul an opportunity to travel during daylight, but also give others some time to network if they so desired. I immediately made my way over to the French, in an effort to inquire if any of them were by chance from the Besancon area. (Besancon, France is where all of my Lomont ancestors hail from; my father and I just visited the area in July of 2010.) None of the French soldiers present at the conference were in fact from Besancon, but they did offer to place me in touch with three of their superiors who just so happened to be based in Besancon when back in garrison. I made plans to follow-up with my new French friends before dinner, at the Joint Operations Center, the hub of all operations in the Regional Command- East area of responsibility. instructor Zalmai, after our chance meeting. ﻿Massoud- "Excuse me sir, where did you learn to speak Pashtun?" Massoud- "Really?!?! My brother is teaching there!" On a bright, sunny afternoon- in the middle of Bagram Air Base; Massoud and I had just shattered the Six Degrees of Separation rule. I've referenced in past blogs my witty, intelligent Pashtu instructor Zalmai. He and I hit it off extremely well during our brief two weeks on campus last summer. 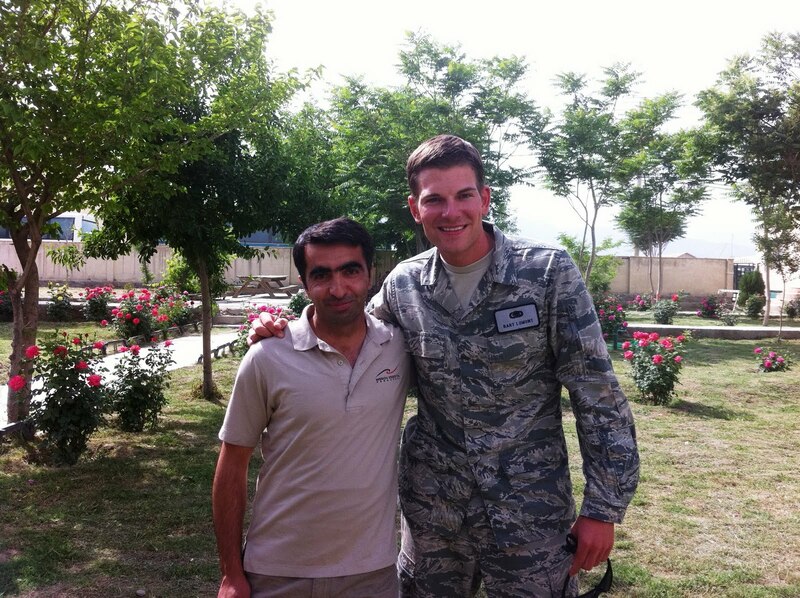 Zalmai is a masters student in the Geology Department at Indiana University, but works on contract with the State Department to provide training to military and government officials in preparation to assignments where they will be speaking Pashtu. As I think about the number of variables necessary for Massoud and I to meet, I can't help but laugh. What are the chances? Massoud just happened to be accompanying the Public Affairs Officer from his post, FOB Shank, to the same conference that day. If I had not mustered up the courage to attempt my best rendtion of Pashglish, Massoud never would have singled me out to inquire about where I had taken my language courses. ﻿﻿Each room at the inn bears a friendly greeting: Welcome to the Media Support Center's "Hotel California", which is followed by font so small that it is nearly illegible- serving as a disclaimer to inform guests that if they find their room is a mess, it is because "the last occupant, your journalism colleague, left the room in the current condition". After unpacking my bags and settling into my room, I decided to make a quick stop-in to the Joint Operations Center in an attempt to link-up with my French comrades-in-arms. The JOC, as it is referred to in the military's world of acronyms, was quite an impressive area in itself. The flags of all partner countries in the International Security Assistance Force proudly line the courtyard of the center, with breathtaking views of the Hindu-Kush mountain range framing a picturesque backdrop to the north. In typical European fashion, the three Frenchmen I was eagerly awaiting introduction to were out on a smoke break. As I approached them out near the smoker's gazebo, I could see them carefully studying my name tag. Fortunately all of the men, the equivalent of two Majors and a Lt. Colonel, spoke nearly fluent English. We discussed a variety of things before I was finally able to explain to them that my ancestors emigrated to Indiana from the Besancon, France area. None of the men were actually born in the Franche-Comte region, but all three currently reside in Besancon as they are based there as soldiers within the French Army. I mentioned my trip to the area ﻿﻿﻿last summer with my father, and they were quite impressed that we had taken the time to visit the "land of our fathers." "Lieutenant" he shouted, "you do know that a French soldier cannot fight without a fair compliment of wine and fresh bread, right?" Up until this trip to Bagram, frankly- I have despised the place. 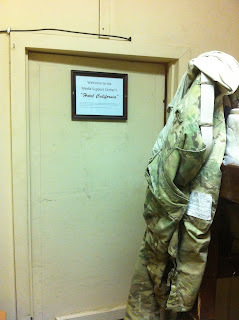 Between the media conference, the rooms at the Hotel California, my chance encounter with Massoud, and finally the brief introduction to the French soldiers; I have to admit that the place I once described as a "hell-hole" has begun to grow on me. As I traveled through Bagram in the process of returning home for my mid-tour in February, I swore that "the next time I stepped foot in this god-forsaken place would be on my way out of the country for good." Chalk another one up to the archives; a few new friends have been made and yet an additional great story to tell for decades to come has developed. 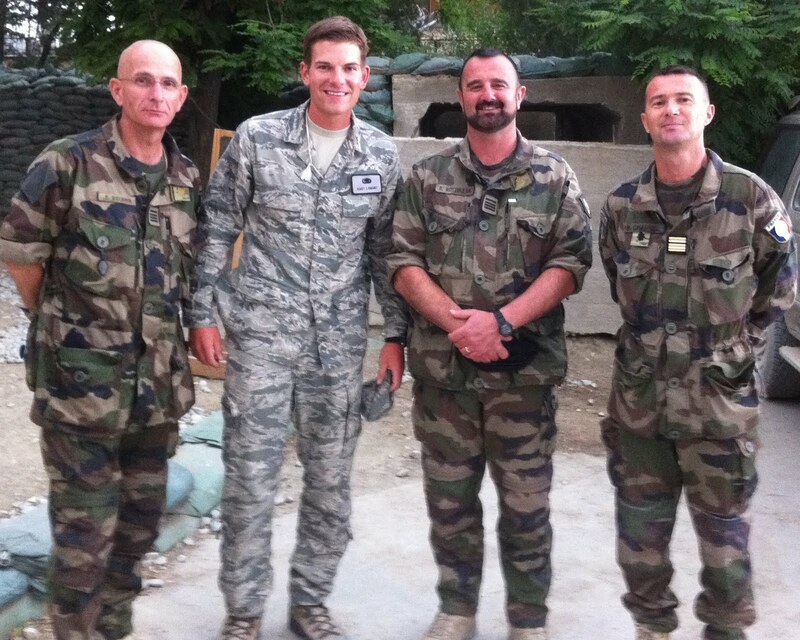 As I told the Frenchmen- "if I miss you in Bagram, I'll see you in Besancon..."
Love the "small world" story. Whenever it's a positive experience, it's always fun to be thinking, "What are the chances?!" Another little piece of home represented in Afghanistan for ya. Be sure to share Maura's piece when it's available!